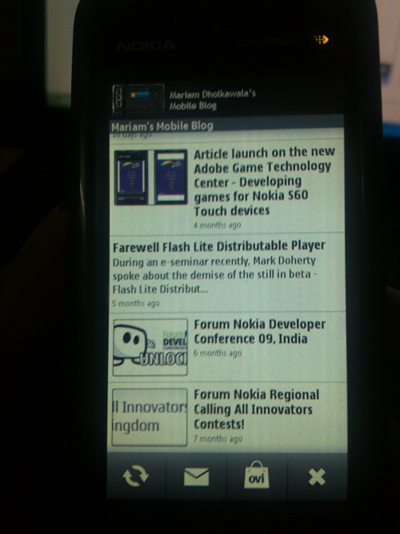 My blog is now available for Nokia devices and can be downloaded from the Nokia OVI Store. I used the OVI App Wizard to create this application which had a very simple procedure to follow. I was required to be the copyright owner for my own content, which I was, so I could easily submit the blog feeds. I then created my blog banner/logo images as per the blog design, set the mobile application color schemes and let the wizard do the rest; i.e create the mobilized content without any more input from my side. The process did come with it’s share of minuses as well, such as a wait before the content went live on the store, besides from other minor issues without which the wizard could have performed better. Overall I think the App Wizard is an extremely easy way to mobilize web content without having to manually write a code. You can read about the OVI App Wizard on the OVI Blog.